As a parent you naturally want the best care for your child and will be looking for a nursery which meets your childcare needs and expectations. AZM Daycare has been designed with this in mind combining all the essential ingredients to create the best possible childcare setting. AZM Daycare is a registered day nursery, which is committed to high quality childcare for children aged 40 days to 3 years. 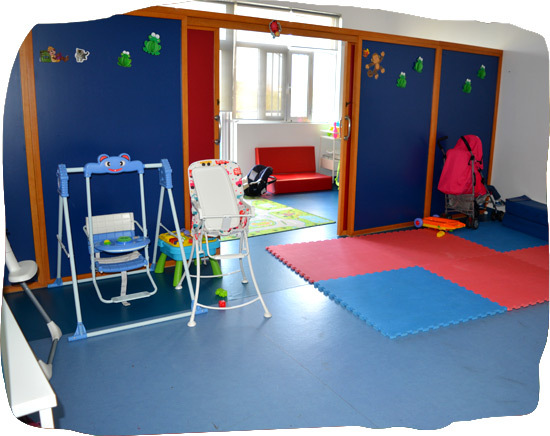 The nursery has a baby room, a toddler room, a nursery room and after school club. There is also a separate library, interactive white board zone, dining room and outdoor play areas all designed to enhance your child’s developing needs. 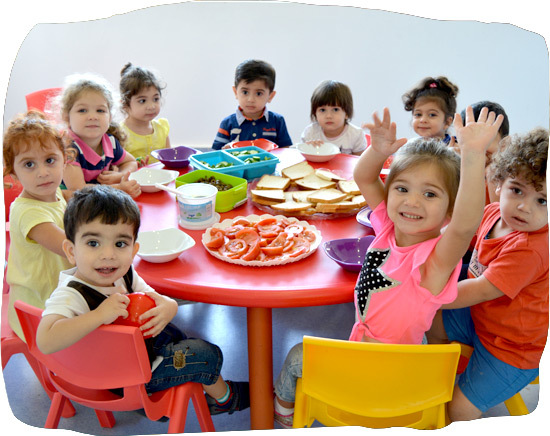 At AZM Daycare your child’s day will be filled with lots of opportunities to have fun, learn, play, laugh, relax and grow. We recognize that every child is an individual and strive to meet your child’s needs while allowing them to build confidence and develop at their own pace. Note: All activities are subject to change in accordance with the children’s needs. In order to help make your child’s birthday more special, we suggest you send a favorite book to share with the children. Ask your room teacher for guidance. Dress your child so he or she can play outside every day. Please label clearly all clothing, coats, shoes etc. Clothes unmarked may be marked by staff. Children need to be dressed in play clothes that can withstand getting muddy or having paint spilled on them. A complete change of clothing (underwear, socks, shirts, pants) is required to be kept at school. Please put them in a labeled shoebox. For those children who are not toilet trained, please provide a large box of disposable diapers with your child’s name on the box at the beginning of school. Please watch for notes that tell you when a new box of diapers is needed. Please inform staff when you begin toilet training so we can coordinate our efforts. Feel free to ask staff about toilet training ideas. Daily schedules and consistent room rules are maintained to provide order and security for children. Teachers plan a variety of appropriate activities to enhance growth, development and self-esteem, encourage self-control and self-directness, and allow for individualized programming. AZM Daycare believes in using a positive approach when disciplining and guiding social interactions with the children and under no circumstances uses or condones physical forms of discipline. We ask that parents do the same while at the Center. If your child becomes too difficult to manage, please ask for teacher assistance. Sometimes children have had a hard day, too. found the emergency contact person, on the child’s information card, will be called and expected to come pick up the child. Please keep all information (telephone numbers, and contact persons) up to date. All children attending the program for 5 or more continuous hours, according to licensing regulations, are required to have a rest period. A rest period consists of allowing the child to rest on a cot for a minimum of 20 minutes or until the child falls asleep whichever comes first. No child will be denied the opportunity to rest if they so choose regardless of the number of hours in attendance. 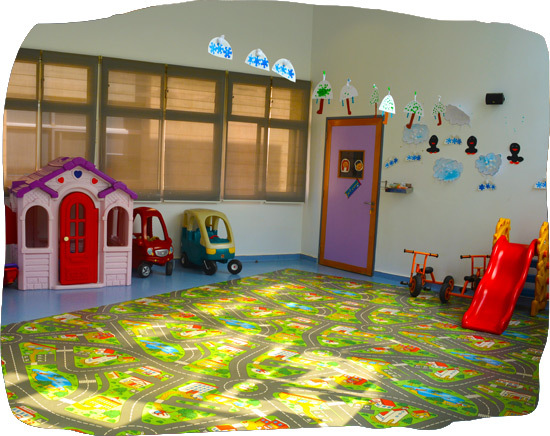 For those children who will not require a rest period, activities are available in the adjacent room for their age group. If your child does not routinely nap but you would like him to on occasion please let your room teacher know in advance. A child’s success in school is greatest when parents and school form a cooperative team with common goals. The partnership we foster between home and school in the preschool programs provides for greater continuity, and coordination in your child’s learning. The more school and family communicate the more appropriate and individualized the education plan will be for your child. We have an open door policy; therefore, parents are welcome and encouraged to be involved in whatever way they can. Please do not send your child to school with toys from home. We cannot be responsible for loss or damage. If a child does bring a toy from home, it will be kept in the child’s cubby until the child goes home. We want your children to enjoy their experiences at AZM Daycare and appreciate that every child is an individual; in addition this will be reflected in the support offered. All the children will have an opportunity to take part in a range of planned activities which reflect the appropriate curriculum as well as including all aspects of children’s learning. There will be a chance for the children to lead their own play and this is supported by the trained staff, child friendly storage and accessible equipment. 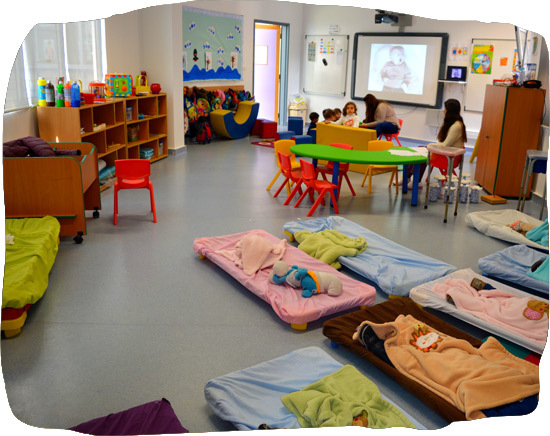 There is a comfortable rest area in each room which allows your child to have a quiet time to sleep or relax. The sleeping and rest time is fully monitored by a member of the team. All the rooms have plenty of space to play enabling each child to get the most out of the activities provided, such as dancing, circle games and large construction equipment. There is a messy play area where there will be creative activities, baking, and water play, as part of any child’s learning by exploring and experimenting with different materials. There are communal break out areas including our interactive whiteboard zone, library and dining area. 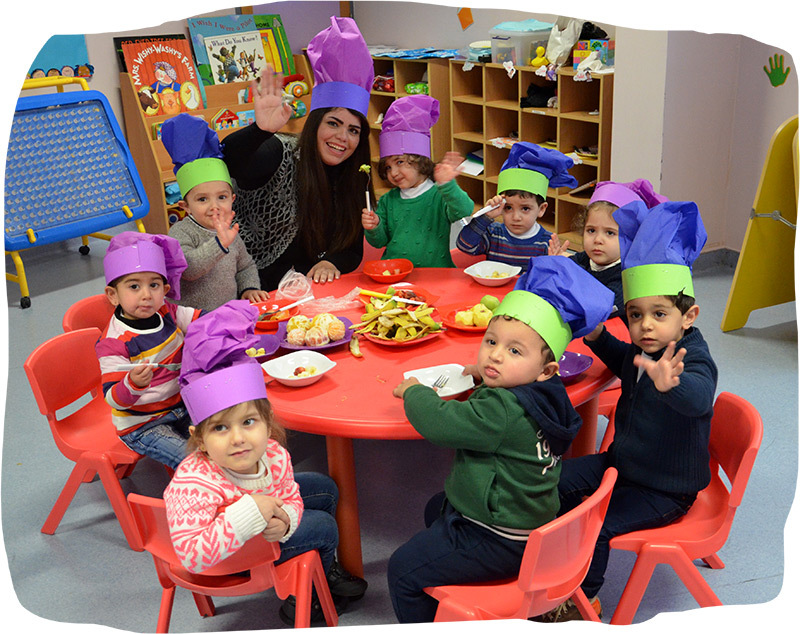 These add variation to your child’s day and a chance to socialize with children of different ages and stages, encouraging the children to feel part of our nursery family. Leaders at AZM develop good eating habits. If your child has a food allergy or specific requirements please inform us. The following policies were written with the health of everyone in mind. Your child should stay at home if he/she does not feel well enough to participate in all group activities both inside and outdoors. The immune system of a preschool child is not fully developed; therefore, he/she may catch a common cold quite frequently. 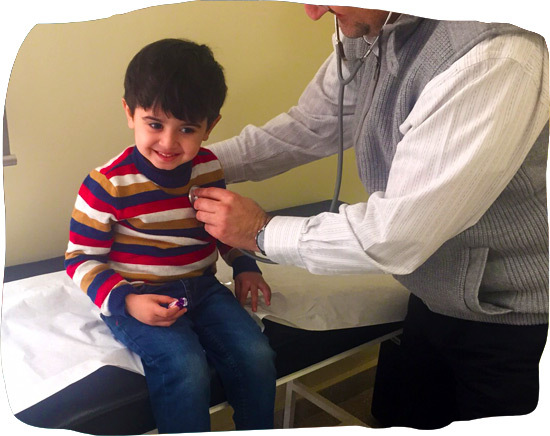 A child who has a simple cold may attend school if he/she feels well enough to participate in all daily activities including outdoor play. However, if there is excessive nasal discharge or a severe cough, it is recommended the child stays at home. If your child contracts a infectious disease, please notify us as soon as possible. Parents of other children will be alerted to exposure to the disease. Your privacy is assured. All medication must be in the original pharmacological container with the Doctor’s name, child’s name and prescribed dosage. A medication permission slips must be filled and signed by the parent with the nurse stating the name of the medication , the time and amount of medication to be administered. Please do not give your child any medicine (this includes aspirin, Tylenol, throat lozenges etc.) to take on his/her own. AZM Daycare wants you to feel assured that your child is in the safest hands. All adults entering the premises must be approved by reception staff or a member of the nursery staff team. Upon your child’s admission you will be asked to specify the adults which are able to collect your child, we will ask you to provide photographs of these individuals, these will be held on your child’s record. Only these adults will be allowed to collect your child unless you notify us of any changes to these arrangements prior to your child’s collection time. Thank you for taking the time to read through our Handbook/ brochure. 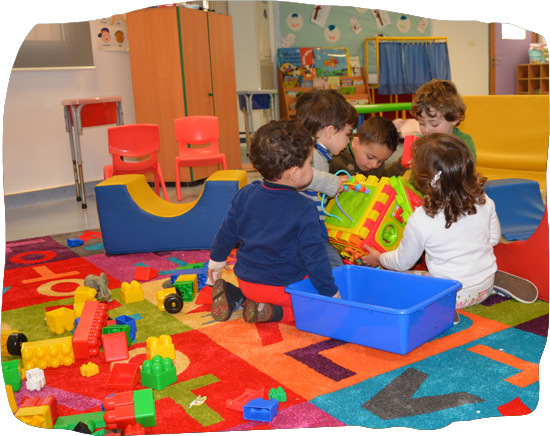 We recommend that you come along with your child leader and take a tour around to sightsee AZM Daycare thus you can see all the fantastic things we have to offer a first hand and arrange to meet with us to discuss your childcare needs.